The top left panel shows original drawings by Surgeon-Captain David Bruce, of the British Army Medical Service, who identified Trypanosoma brucei as the cause of the 'tsetse fly disease' in African cattle in 1895. The human disease is called Sleeping Sickness: infection leads rapidly to coma and death. 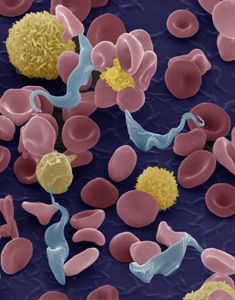 The left panel shows a color-enhanced scanning electron micrograph of Trypanosoma brucei among blood cells. © Michael Duszenko, University of Tübingen, Germany. A comprehensive set of ~13,000 complete and partial VSGs and corresponding coding sequences from several trypanosome species and strains are available in several permutations on a BLAST Server. The corresponding files in FASTA format can be downloaded (some purpose-made bioinformatics perl scripts to be added). Use the Site Search panel to find something quickly. Unless indicated otherwise, all material on this site is © (Copyright) of the author or other parties and may not be republished without permission. If you have comments, problems or suggestions, please contact me. Clear your cache to ensure you are viewing current versions of these pages, which are updated as time permits or as information changes significantly. The information and opinions on this web site are the responsibility of the authors and not The Rockefeller University.